Needle (Thai Comic Books, 2013, etc.) 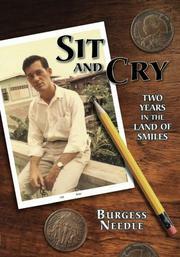 recounts his time in Thailand as a Peace Corps volunteer in this memoir. Needle joined the Peace Corps mostly to avoid the draft. It was 1967, he was 25, and his student deferments had come to an end. Before too long, he found himself in Thailand with little knowledge of the culture or the language, serving a two-year assignment assisting the teaching of English to the children of Nang Rong, the richest district in Thailand’s poorest province. (The name Nang Rong, as Needle’s handler gleefully informed him, means “To Sit and Cry.”) Though Needle assumed he would be instructing Thai educators on how best to teach English, he was immediately put in charge of teaching the students directly. They were mostly the young children of poor rice farmers who came to school by bicycle or on foot. His students helped to introduce him to the universality of childhood, even as everything else around him seemed so undeniably foreign: the food, the weather, the customs, the constant smiles of his Thai neighbors. Needle became proficient in Thai and acclimated to the local rhythms of Nang Rong. As he attempted to put together a life of work, leisure, and romance—one he got over some of the horror stories of sexually transmitted diseases put into his head during training—Needle found a place for himself on the other side of the world that was simultaneously alien and recognizable. Needle’s diarylike account recalls his exploits from every few days for most of the two years he spent in Thailand. The prose is literary in its eye for details, seeking always to capture the otherworldliness of his immigrant experience: “The monk from the bus was met by a contingent of other monks, all carrying black umbrellas. They brought an extra one for him....Their leaving presented a saffron tapestry punctuated with ebony parasols.” These entries are interspersed with photographs and even poetry from his time there, which paint a picture of a young man using the opportunity of a new environment to grow into the adulthood of his choosing. The book does not have much in the way of a plot, and readers might drop off once it becomes clear that no mammoth epiphany or climax is waiting for them. Even so, Needle has crafted a memoir of the traditional mold: a remembrance of a place and time that no longer exists, recalled in precise detail and recorded for the purpose of preservation more than entertainment. There is something alluring about the Thailand of Needle’s memory—the way he summons it and his old self with it—that keeps the reader turning the pages, digging for a deeper truth. A well-written, if somewhat shapeless, Peace Corps memoir.